There is no evidence that during several centuries of habitation the Cayuga Nation of the Haudenosaunee, or Iroquois people, ever settled on the hilly plateau of densely wooded land up above the southeast end of Cayuga Lake where Cayuga Heights is located. The fixed settlements of the Cayugas (Gayogogoh:no, “People of the Great Swamp”) were concentrated at the north end of the lake. Apparently what Cayuga settlement that did exist at the south end was concentrated down below on the flat land around the head of Cayuga Lake and its inlet in an area they called Nedodakheat. Archaeological evidence suggests, however, that before the Sullivan Campaign of the American Revolution in the fall of 1779, when colonial forces destroyed their villages in retribution for siding with the British, the Cayugas hunted and camped in the Cayuga Heights vicinity. It may seem ironic, given the controversy centuries later, that deer hunting was one of the earliest human activities in the area, but so it was. Today, it is hard to find any echoes of the tribe’s presence long ago other than on a few streets with “Iroquois” and “Cayuga” in their names. After the Revolution, the 1,164 acres of land that became the present-day Village of Cayuga Heights fell within the Military Tract of Central New York, the enormous expanse of land that was divided into twenty-eight townships and then subdivided into 600-acre lots given to veterans. The bit of the Military Tract that became Cayuga Heights included portions of several lots, namely numbers 88, 89 and 90 in Township 22, Ulysses. ​The intent of the land distribution was to encourage the establishment of farming communities, but many lot recipients never took up the land they were given. Much speculative buying and selling took place, and 88, 89, and 90 in Ulysses were no exception. 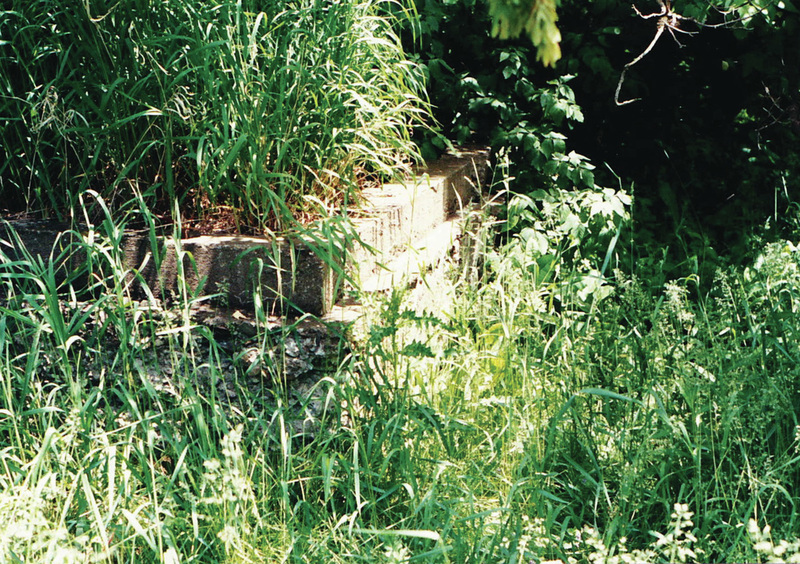 Lot 88 on land sloping down to the southeast shore of Cayuga Lake in Ithaca was drawn by a Captain Andrew Moodie and eventually sold to the Renwick family, who held on to it for over a hundred years. Lots 89 and 90, most of which fell on higher and flatter ground more suitable for farming than 88, were drawn by veterans named Lighthall and Risley. Both lots changed hands, were broken up, and new owners, such as Isaac Cradit who bought property in the middle of lot 90, chopped down hundreds of trees, pulled out stumps, and plowed fields to convert the woodland into farms. 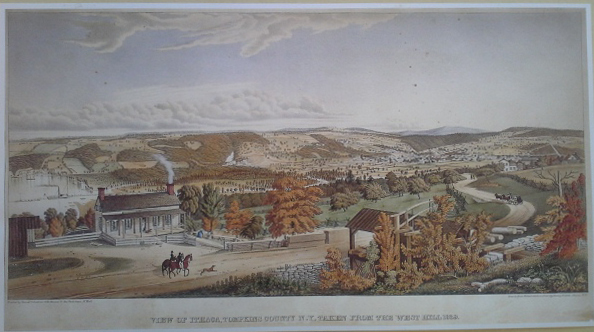 Henry Walton, “View of Ithaca, Tompkins County, Taken From the West Hill 1839,” Lithograph. Collection of The History Center in Tompkins County. 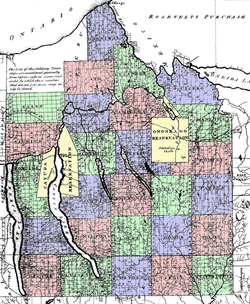 The period of settlement was one of many shifts in town and county boundary lines within the Military Tract. 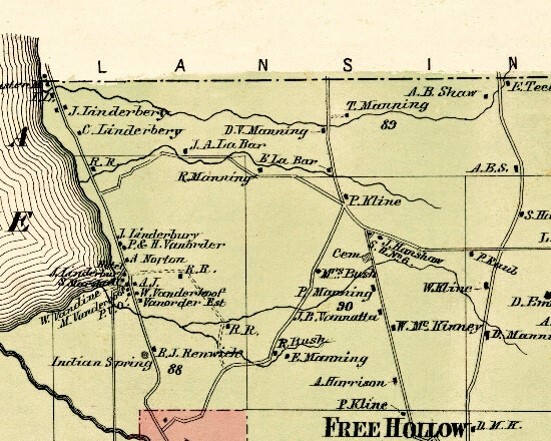 Ulysses Township, first drawn on the map of Onondaga County in 1794, became part of Cayuga County in 1799, Seneca County in 1804, and finally Tompkins County when it was created in April 1817. In 1821, on 36 of the 580 total square miles of land in Tompkins County the Town of Ithaca was formed looping around the east, south and west sides of Cayuga Lake. The Village of Ithaca, which became the City of Ithaca in 1888, was in the center of the town fronting on the lake. Establishment of the Town of Ithaca set in place the municipality within which the little Village of Cayuga Heights would be founded overlooking the east shore almost a century later. From “New Topographical Atlas of Tompkins County, New York. From actual surveys especially for this atlas,” Stone & Stewart, Philadelphia, 1866. Like the rest of Tompkins County during the nineteenth century, when its population reached just over 12,000, almost all the land in the Town of Ithaca was farmed. By the end of the Civil War in the little portion that would become Cayuga Heights roughly a dozen farms were clustered near what is known today as Community Corners at the junctions of Hanshaw, Pleasant Grove, East Upland, and North Triphammer roads. They ranged from small, subsistence operations to larger ones like the farm Isaac Cradit established and sold around 1860 to Peter Kline. Sixteen year-old Carrie Manning kept a diary in 1869 providing a unique chronicle of life on her family farm (marked as "T. Manning" on the map shown). Farming persisted well into the twentieth century around the Corners leaving behind a precious legacy of old houses interspersed among the hundreds built when Cayuga Heights became a suburb. The most important event in the nineteenth century for the future of the area was the founding of Cornell in 1865. ​ W. Glenn Norris, Old Indian Trails in Tompkins County (Ithaca, New York: DeWitt Historical Society of Tompkins County, Inc., 1988 reprint, 2d edition 1969), 37. Carol Kammen, The Peopling of Tompkins County, a Social History (Interlaken, NY: Heart of the Lakes Publishing, 1985), 55; and Jane Marsh Dieckmann, A Short History of Tompkins County (Dewitt Historical Society of Tompkins County, 1986), 25. Patricia Longoria, From Farm to Suburb, a History of Place Names in Cayuga Heights, Ithaca, New York (Village of Cayuga Heights Historic Preservation Committee, 2015). “Land Use,” Village of Cayuga Heights Comprehensive Plan, adopted January 13, 2014, 16. Map enclosed in The Balloting Book and Other Documents Relating to Military Bounty Lands in the State of New York (Albany: Packard & Van Benthuysen, 1815) at The John Marcham Library, The History Center at Tompkins County. William Heidt Jr., Ithaca City Historian, The Blue-Eyed Lassie and the Renwicks in Ithaca (Ithaca: DeWitt Historical Society of Tompkins County), 5. Albert W. Force, “Town of Ithaca Separate Political Entity Since 1821,” Ithaca Journal, March 22, 1965. T. H. Hewitt, Landmarks of Tompkins County, New York, including a History of Cornell University, edited by John H. Selkreg (Syracuse, New York, 93-94 and 134-135). Village Historian Beatrice Szekely, a former village trustee and deputy mayor, and Deputy Historian Patricia Longoria will discuss their ongoing research into the eighteenth and nineteenth century foundations of the Village of Cayuga Heights. They will review how the intertwined histories of Native American settlement in Tompkins County and nineteenth century migration to the northeast region of Ithaca in the early 1800s have informed the Village's twentieth century development. Formally incorporated in 1915, Cayuga Heights was then a tiny streetcar suburb linked to Cornell University. Today it is known as a quintessential university suburb within the greater Ithaca area. Made possible, in part, by a Tompkins County Community Celebrations Grant.